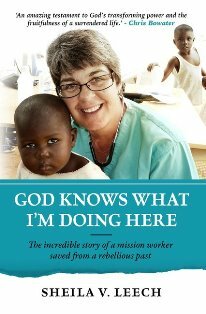 QUITO, ECUADOR (ANS – October 8, 2017) — God Knows What I’m Doing Here by Sheila V. Leech carries in its title just the right words to attract readers interested in spirituality. But the author’s lively autobiography is also piquing the interest of others. With each chapter, the “Here” mentioned in her title changes — from her parents’ place outside Solihull near Birmingham in the 1970s to several years later, living in a rustic dwelling with split bamboo walls in Ecuador. A missionary nurse, Leech has grown accustomed to — or at least being functional and effective in — areas devastated by natural disasters. Compelling accounts capture the shock and grief of victims even as she probes inside and recalls how she took in the jarring stimuli around her. A reader may begin to grasp what goes into debriefing and then appropriating enough grace to face forward, stepping into future humanitarian crises. An early chapter has Leech driving a pickup truck in the several-hour drive from northwestern Ecuador to the capital, Quito. When a man standing on the highway beckons to her, she is lost in thought and nonchalantly downshifts to roll to a stop. Shocked to find herself staring into the business end of a pistol, she does what the man tells her. She and dozens of other drivers find themselves the unwilling participants of a mass holdup, whispered to have been staged by Colombian guerrillas (an explanation officially denied at the time by Ecuador’s government). Safe but severely shaken, Leech drove away, realizing then and afterwards that life on Earth is fragile. The experience pushed to the forefront eternal considerations. She saw her own destiny after death as secure. But what of those who sat frightened in their vehicles along a stretch of remote highway in northwestern Ecuador? What of their eternal destiny? The missionary nurse realized anew the need for evangelizing the lost. As vice president of global healthcare for the U.S.-based evangelical mission agency Reach Beyond, Leech determines strategies for offering medical help to people in areas that are physically needy and spiritually hungry to hear of God when disaster strikes. One early disaster response took Leech and others to Pakistan following an earthquake in 2005. 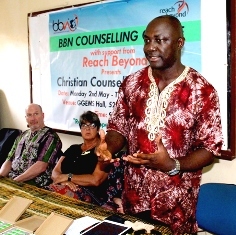 She faced a barrage of questions initially on what Reach Beyond’s response to the needs might be. She learned, however, that Ecuadorian and expatriate hospital staff member not only could go, but would go to the dangers half a world away. Two groups traveled to Pakistan in what was to become a working model for a ministry at Reach Beyond later called emergency medical response teams. Ecuadorian staff members from the mission’s Hospital Vozandes-Quito (and then Hospital Vozandes-Shell) work hand-in-hand with expatriate missionary doctors and nurses to bring aid to people caught up in catastrophes. 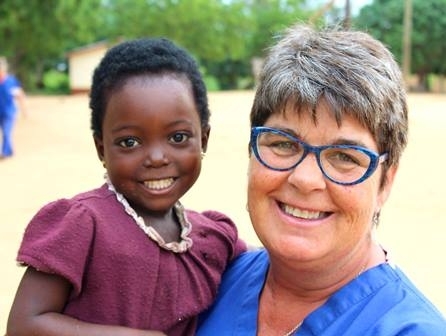 Leech writes about rising to the occasion as she and several other non-U.S. female medical workers went to Lebanon where, in war-torn circumstances, they ministered in Jesus’ name amid language barriers and cultural restrictions. In reading God Knows What I’m Doing Here, however, one should not miss the why of what she does in far-flung places with hardy, self-sacrificing staff and perhaps too few resources. The book is about rising and pushing, but ultimately it demonstrates through Leech’s life story what Christianity holds at its core: faith in Jesus Christ and dependence on the grace of God. 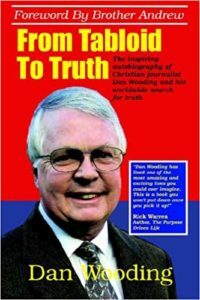 The book, released on Sept. 1, was published by Authentic Media (http://www.authenticmedia.co.uk/) a U.K. publishing house that is offering a paperback version for £9.99. On Amazon.com the Kindle version sells for US$9.99 while the paperback retails at US$13.89. *In 2015 this writer reviewed and offered suggestions to an early draft of God Knows What I’m Doing Here at the request of the author. Photo captions: 1) Book cover. 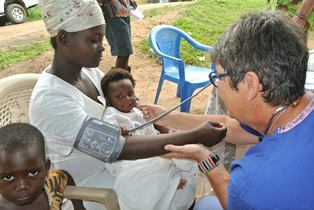 2) Sheila, treating a child in Ghana. 3) A training session in Sierra Leone. 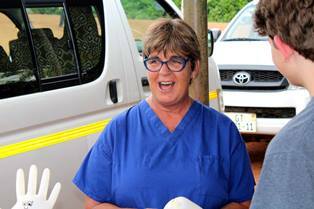 4) Sheila, pictured here in Ghana, loves her work. 5) Ralph Kurtenbach at the microphone. About the writer: Ralph Kurtenbach and his wife, Kathy, have lived in Ecuador since 1992, where they minister with Reach Beyond. Ralph blogs at www.calloftheandes.wordpress.com and helps to mentor Latinos who want to join in taking the gospel to other parts of the world. His e-mail is: rkurtenbach@reachbeyond.org. ** You may republish this or any of our ANS stories with attribution to the ASSIST News Service (www.assistnews.net). Please also tell your friends and colleagues that they can receive a complimentary subscription to our news service by going to the above website and then signing up there.